Empire of Ruins by Arthur Slade. Book 3 of The Hunchback Assignments. 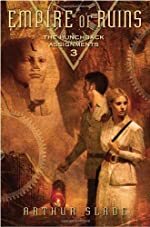 Review: Empire of Ruins is the third installment of the Hunchback Assignments series written by Arthur Slade. The main character of the series is Modo who is a teenage spy and also a deformed shape-shifter. Modo has heard rumors of the mysterious God Face. They say it is extremely powerful and makes everyone who looks upon it mad. Modo's mission is to go into the Australian jungle to find the God Face and bring it to the British Empire. But, missions like these aren't always that easy. First of all, does the God Face even exist? Also, Modo and his partner, Octavia, are being followed by the evil Clockwork guild. Their leader, Miss Hakkandottir, has some new weapons: poisonous mechanical falcons! But that's not all, there's also an assassin and jungle tribes to look out for. Will they be able to get the artifact in time? Or will their failure lead to their deaths. Empire of Ruins is an amazing, action-packed adventure! It thrilled me and was the book I've been looking for. Empire of Ruins had just the right amount of fighting and a great setting for the story. The setting helped give a feeling of suspense because the thick jungles in Australia give a perfect hiding spot for Modo's enemies. Also, the characters are very exciting and different. In some books, a spy is usually very fit and has no powers except for a few spy gadgets. However, Modo is a hunchback who can shape-shift. This was very surprising for me. I recommend this book to tweens who love to read action-adventure novels. It's sure to be a heart stopping story. The only problem I personally had was that there was very little romance. But other than that, it was exceptional! I would rate this book 9 out of 10 stars. Review written by Sharielle (6th grade student). We would like to thank Random House for providing a copy of Empire of Ruins for this review. Have you read Empire of Ruins? How would you rate it?